I’m excited but a little bit nervous because I don’t still know anything about it. This entry was posted in my life on 01/16/2018 by anne. I found a memo that I wrote when I had gone to Mount Koya in May, 2011, while I was organizing my old drawings. I had the chance there to solve some mystery that I had had for the long time, though I coincidentally got to go to Mt. Koya. It will be the long story, but I should tell you about the story 25 years ago. Though you might be surprised because I tell you such a thing suddenly.. 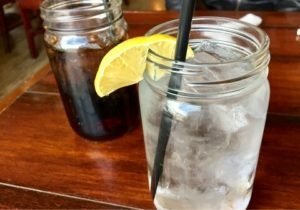 I had a incredible experience that a ghost jumped into my body. I felt his emotion and thought his thought as like mine at the moment.. It was so weird and terrified but I was very sad because he had been feeling so.. Anyway, I had no idea what to do and how to do for let him go. One of my friend introduce a Buddhist monk to me and He gave me a short sutra. And the sutra worked! The ghost left me.. I didn’t know what the sutra means but it was important for me. I had used it for the long time since then.. I was wondering what the stura was and had been looking for the meaning of it since then, but I had not been able to find out.. It has passed about 15 years. I had sometimes had got to heard the sound that wasn’t real like clairaudience. And I had heard the sound of a sutra as clairaudience a few times before I went to Mt. Koya. It was the first time that I heard that stura. It was different from any sturas that I’d ever heard before. That was the story before going to Mt. Koya. Here is the memo at that time below. 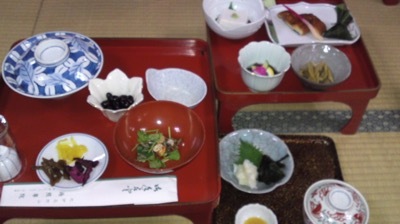 I stayed at a temple and had a delicious vegitarian diet there. I was planning to attend a morning chanting. I had a dream at the night. I was about to be late for the morning chanting and hurried to go to the main building. In the morning, I was in time at the main building (actually 5 minutes before;-). And I was so surprised because the stout Buddhist monk coming in was just him I saw in the dream last night! I was surprised again when he started chanting! Because the sutra was just it which I had heard a few times as clairaudience. The sutra was Shingon sect.. I had been wondering what kind of sutra it was since I heard, so I was glad I found it. I don’t still know why I heard the sutra of Shingon sect, though.. 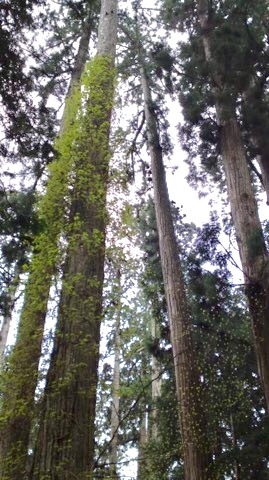 I got an another answer at Mount Koya, too. I found the leaflet that I got at Kongobuji Temple contained the part of the words of the sutra which a Buddhist monk gave me 25 years ago. I was very glad and went to ask Buddhist monks about it. It was the first time that I could get the crue of it. It was a mantra of Shingon sect. However, the Buddhist monks didn’t know the mantra and couldn’t find the same one, though they checked many books. One of them told me that the mantra I had might not be one of Shingon but Tendai. I was very disappointed and went back to home.. I couldn’t give up. I believed the mantra was one of Shingon because the sutra I heard was Shingon. I started internet surfing in Esoteric Buddhism, Shingon and Tendai. And finally I found the same mantra! It was the mantra of Shingon sect as I thought. I had been surfing the internet for a few decades and never found it.. I guess I needed to put the words like “Esoteric Buddhism” or “Shingon”. I should have reached to Esoteric Buddhism and Shingon earlier..
That’s why the Buddhist monk said to me, “you are late to come!”, didn’t he? I don’t also get it why the Buddhist monks didn’t know it despite it was the mantra of Shingon. Anyway, I felt so fine. I solved the mystery that I had for the long time.. I don’t know why but I got the confidence that I have something connect with Esoteric Buddhism and Shingon. By the way, the mantra I have been using was for self-protection. It is said that this mantra protects a person against not purified souls or wicked souls. I was surprised that there is such a mantra. But I also know it works. I’m really interested in mantra now. I will introduce the picture I drew after going back from Mount Koya in the next article. 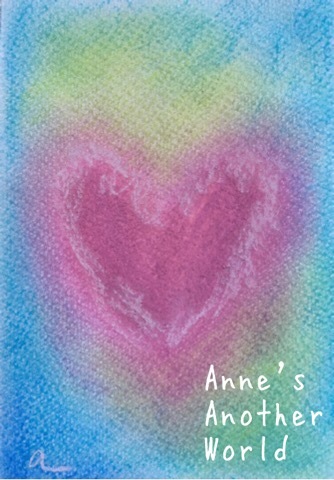 This entry was posted in my life on 12/29/2017 by anne. Geometric Pattern of Moon and Full Opened Chakra? I found the memo I wrote 7years ago, when I was organizing the pictures I drew before. I’d had many strange and mysterious dreams or visions for a while when I had drawn the pictures I’m uploading these days. The memo was written like below.. I found the full moon when I looked up. But it was unusual and not yellow but gray. And also the moon had many small geometric pattern. It was so beautiful but very strange sight. I could see the sun when I looked up on other side. But it had also different color from the usual one. I don’t know why but I knew what I saw at the first was the moon and what at the second was the sun. 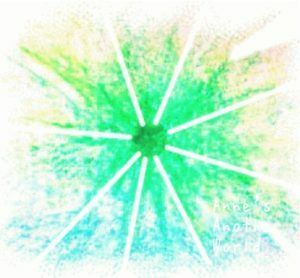 Suddenly, a bright green light gushed out in all directions towards the outside from the center of me, and my body scattered..! I felt it with a tremendous shock that I was scattering with the light of green from the center of me, around stomach. I had no pain but horribly dazzling and shocking.. I thought my stomach was sparkling at that time but I guess now that it might be the heart chakra because it was the green light. I know it was just a dream…. But, it was too strange and shocking to think as a dream……. I felt it like reality. I could imagine that it would be like this if I actually exploded from inside. I had the dreams that I saw the moon with geometric pattern several times after that. They are completely unfamiliar words.. I never know what to do..
Is there something hidden I should know in the dream? What is the geometric pattern of the moon? What is “the melody of the sun drawing spiral”? I heard it from my Reiki teacher later that there are people who see geometric pattern when the chakra got fully opened. If so, my heart chakra might have fully opened at that time? I think it might be true because I have something come to mind. Above is the content of the memo. I really had the dream of the geometric pattern of the moon for many times in those days. That’s why I remember it well, but I couldn’t remember the event that my body scattered like exploded till I saw the memo. I couldn’t also remember the helpful information that people could see geometric pattern if their chakra fully opened. And as a good timing, most of the mysteries I had in the dream have been solved just a few months ago. I met someone who can see one’s past life, and she told me about my past life and why I had such a dream. I realized the answer of the dream just came at the right time. This entry was posted in my life on 12/24/2017 by anne. 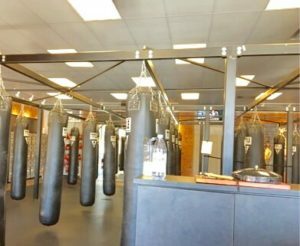 I had a chance to join a class of kickboxing as a trial. At first a trainer wrapped my hands and then I wore gloves. I learned jab, cross, hook and so on before class. I had the first punch to a sandbag. It was fun and the trainer was kind. 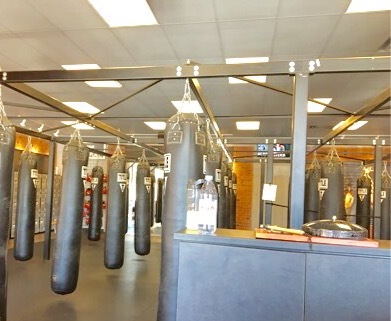 I’d already started to like kickboxing. I knew that it was too much hard for me to take the class a few minutes later.. I attended 60 minutes class because they said they have just 60 and 75 minutes classes now though I desired shorter class. But the lady, my pair was very kind although I was bothering her. I would have been satisfied just kicking a sandbag but I had to develop my abdominal muscle despite I have zero abdominal muscle, so I’m afraid that I would just have been screaming loudly.. Still, I should say that kicking sandbag and exercising were unexpectedly fun. And I was happy to meet good people there who said to me again and again, ” you did good job! !”, though I know I couldn’t. This entry was posted in my life on 12/05/2017 by anne. 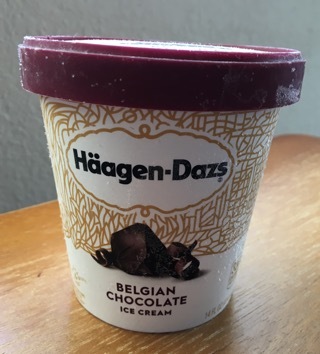 Recently, I’m into belgian chocolate, Haagen Dazs. And now, I can buy the ice cream for half price at the supermarket near my home! one 414ml Haagen Dazs is just for $2.50! It’s incredibly cheaper than the price in Japan. I’d used to buy a 110ml mini cup Haagen Dazs about for 250yen in Japan. There is a surprising things while I’ve been here. It is about the display like “10 for $10” of the supermarket. “10 for $10” means “you can buy for $10 if you buy 10 items” in Japan. If I buy just one, the price will be higher. But, it’s not true in the US. We can buy one just for $1. I don’t understand but it is really good for customers. It said, 2 for $5, for belgian chocolate, Haagen Dazsa. This entry was posted in my life on 11/22/2017 by anne.